So today’s post is kind of a two posts in one deal… but humor me and read it to the end. When the Chipotle video came out I wasn’t going to say much. I wrote this post. I planned to leave it at that. It’s not that I didn’t want to say more, I just don’t want to be known as a person who is always taking this company or that company to task over something I find offensive. 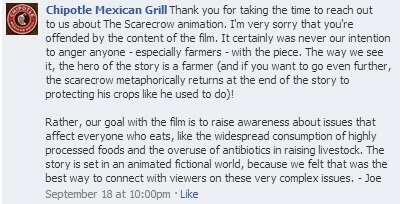 I first learned of Chipotle’s new Scarecrow video through Dairy Carrie’s Facebook page. As one of her followers I look forward to reading her opinion and appreciate that she keeps fellow farmers along with the general public up to date about agriculture hot topics. Her most recent post hit a nerve with me, but not the same nerve it may have hit with you. You see, my family produces milk that goes to a local cheese factory that makes cheese for Chipotle Restaurants. I want to thank Carrie for responding to my Facebook message on this issue and allowing me to express the opinions of a farmer who is working firsthand with the restaurant. 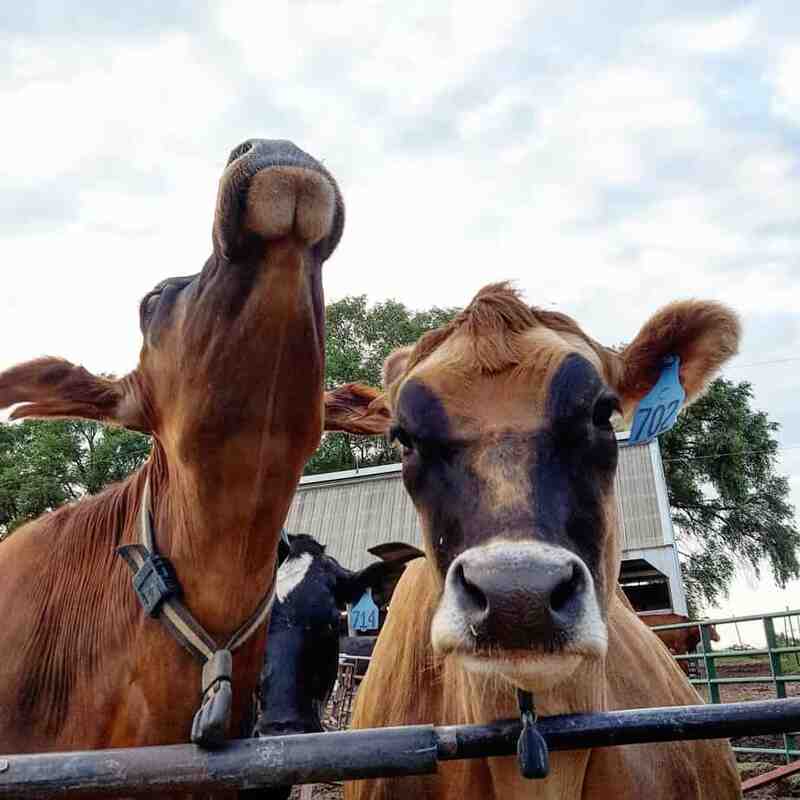 It all started about a year ago when our dairy marketing representative approached us about participating in Meister Cheese’s Animal Friendly Family Farms program which partners with Chipotle’s Food With Integrity program. We rotational graze our cows, and he thought we would be a good fit. After explaining the program’s Standard Operating Procedures (SOP’s), we agreed to have a representative from the cheese plant visit the farm to see if we would meet the requirements. Most of these SOP’s were things we were already doing. Such as making sure cows were above a 2 in body conditioning scoring; having no animals above a 3 on the locomotive scorecard; no tail docking; not using rBST; having access to pasture but shelter during inclement weather; and taking care of sick animals according to labels on antibiotics and with the help of a veterinarian. Okay, so SOP’s is language used on farms, but it can also be used in other industries. Basically it outlines how things are to be done. Think of it kind of like an instruction booklet. Everything fell into place, and we signed on. Over the last past year, Chipotle has sent representatives three times to tour the farm. One of the first questions I ask is what is their connection to agriculture? This is important to me because I feel that in order to fully comprehend what we do the representatives or inspectors need to have a basic understanding of agriculture. The first representative was in April. He was in independent inspector hired by Chipotle who had experience in meat inspecting and ranching from out West. We had a good conversation as he explained what Chipotle was looking for in their dairy farms, and we explained how we raised our cows. It was a learning experience for both of us. Then sometime the first part of summer another representative who was a Chipotle employee came for a visit. He was an organic beef and grain farmer from Southern Illinois. I hope you are starting to see a pattern here. Chipotle is using people with agriculture backgrounds or farmers themselves to promote their Food With Integrity program and check up on current farms participating in the program. I think that is great. They realize they need to have experts in that area do the work for them. For that I give Chipotle a pat on back. Toward the end of July we had a third visit from another Chipotle employee. Unfortunately I was out of town that day and my husband conducted the tour himself. He doesn’t remember too much about the guy. I’m the one always asking their background. My husband just gives tours. This time though he left us with coupons for free meals at Chipotle. These coupons are like baseball cards. One side has a picture of a farmer growing food for their restaurant, while the back talks about the farm. See pictures below of the front and back of the card. Wow – what a positive marketing idea to connect the consumer with where their food comes from. 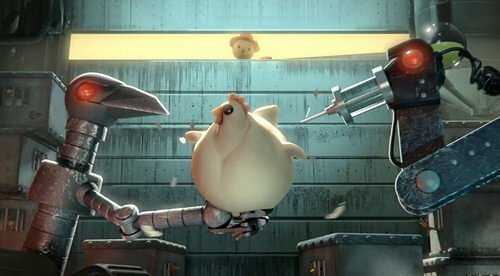 Yes, I am disappointed that Chipotle is using a video such as Scarecrow to get their Food With Integrity message across. They know firsthand from their visit to my farm that cows are not kept in a box. But on the other hand I am proud of them for the positive things they are doing, such as employing people with an agriculture background and developing those trading cards. Chipotle is marketing their restaurant towards a niche market. Niche marketing is not new to the agriculture industry. I feel Chipotle has made a good start, but took a wrong turn when they released their Scarecrow video. 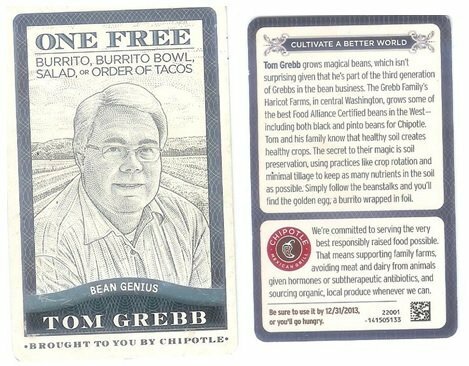 I would like to see them release some videos along the same lines of those trading cards where they take consumers on a tour of the farms producing the food they serve in the restaurants. Those of us in the agriculture industry need to keep praising Chipotle for the good things they are doing, and educate them on what we do so they can accurately communicate with their customers where food comes from. I am glad to know that Chipotle does walk the talk when it comes to ensuring the farmers that supply their resturants fit their criteria. I think Christina did a great job sharing her perspective as one of those farmers. We both agree that a company is always better to promote what they love rather than bashing other ways and ideas. Chipotle didn’t have to go down the road of bashing agriculture, but they did. Once again we have another company using fear to market their food. Not OK. However, according to several facebook posts, their video wasn’t even about portraying their idea of modern animal agriculture practices. I decided to make up a little survey about the video, I did my best to make sure that my questions weren’t biased and I sent the link off to some non farm friends and asked them to send it on to people they considered to be middle of the road. I asked my friends to not share who I was or why I was asking. Out of the 17 people who responded only 1 person had seen the video before this, 6 said they were Chipotle customers. What do you think about what this video shows? What is your chief concern about the food produced in America? So who do we believe? Do we believe that Chipotle wasn’t taking aim at most farmers and was attempting to make a video that would ignite conversation about processed food? Or, do we believe that what we see and what the average customer sees? Maybe we should all just hope that this is what people really see? Is Chipotle having a moral awakening, or is it their pocketbook? « Duh Chipotle, the udder is on the bottom of the cow, not the side. 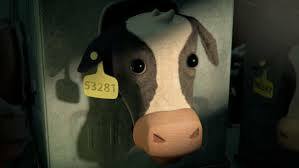 17 Comments on The Chipotle Cheese Farmer & What Does The Chipotle Video Portray? Chipotle needs to have Ms. Winch as their spokesperson. I’d buy their food if she was in their commercial. Too bad they feel hitting below the belt attracts more business than taking the moral high road. Thank you, Ms. Winch for telling us about your experience. I appreciate your point of view. Good luck to you in the future! Thank you, Dairy Carrie, for once again bringing us valuable stories about relevant topics! Props to the New Yorker for also having a balanced look at this video. This post validates the claims Chipolte makes in the New Yorker article. 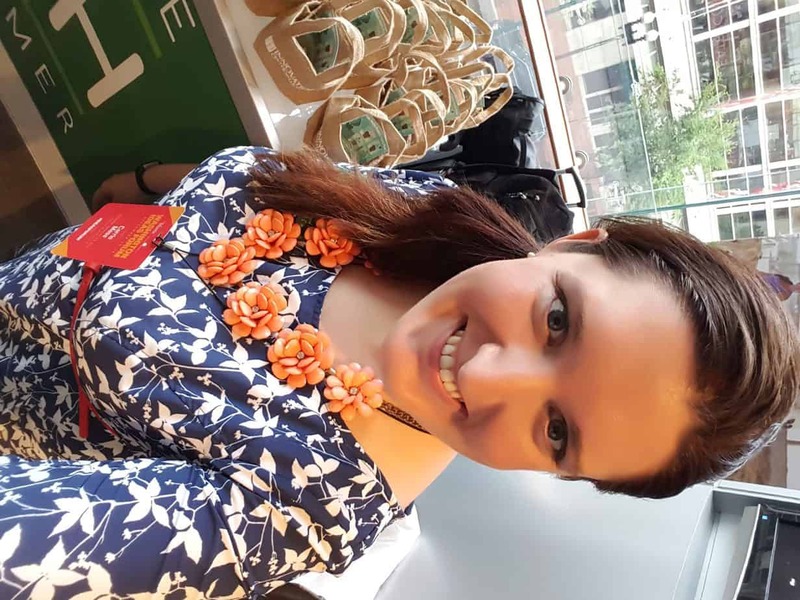 Thank you Christina Winch for sharing your story. Chipotle’s, approach would have made more sense if they went more along the lines of McDonalds and Dominos Pizza with the “see what we are doing now” approach using the actual farms and farmers in the ads. All the cartoons do is allow the creator to bend them around to add the “fear factor” that they can’t seem to capture in real life. All hybrid plants such as tomatoes and corn do is target diseases that can be genetically altered to be non existant and increase harvest productions by turning on a hereditary switch to produce more fruit or grain. 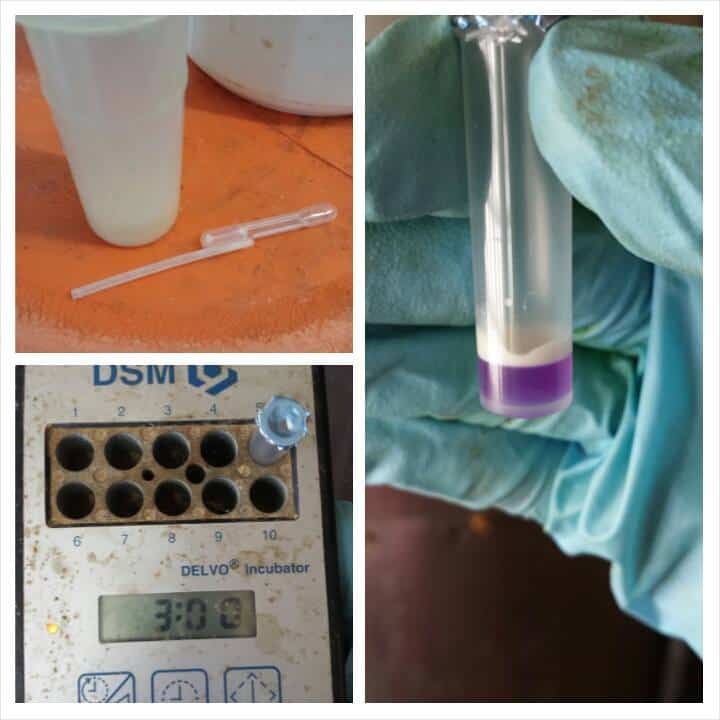 As far as the dairy side goes there is such a thing as preventative medicine practices, I find it hard to believe that there are farms out there that are pumping their herds full of antibiotics that are unnecessary. Is it possible? yes. 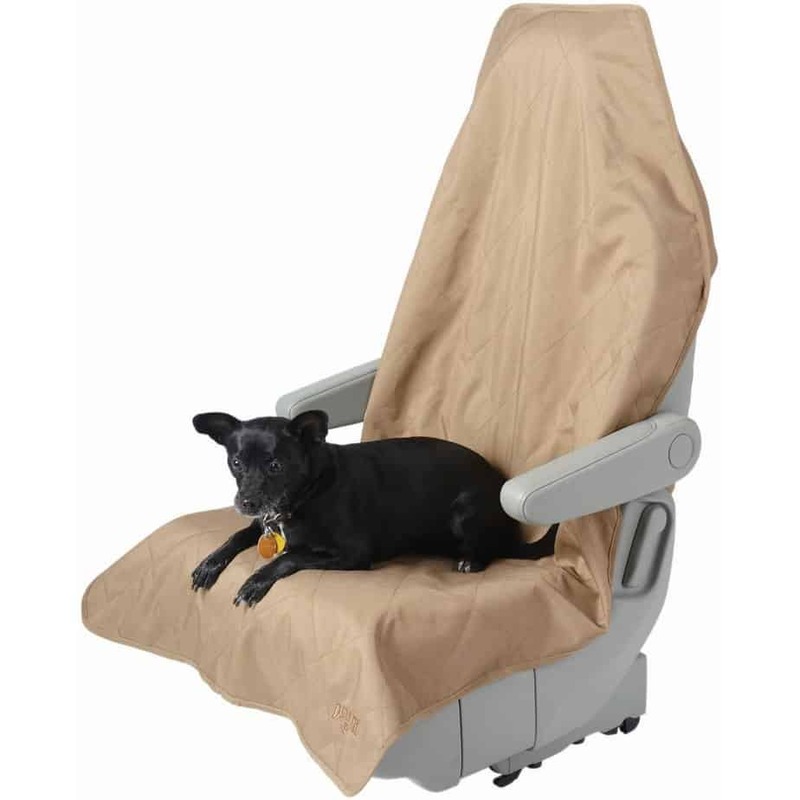 Is this type of management cost effective? no. If a farmer doesn’t get out and see what is happening on his farm and is relying on hired help to run his farm then sure some problems will arise. I really dislike the terms factory farms and corporate farming, pink slime. Just a few thoughts and you are an amazing person Carrie. Keep up the good work! Thank you! The responses of the ‘man on the street’ say it so much better than we ever could. I found it hard not to laugh when I read that what our grandparents ate WAS real food but that what we eat today isn’t. They think the original ear of corn was about, what, the size of your pinky finger or so? How much land would you have to plant to get a good meal out of that? Also, I love the idea that bland foods that all look the same was driven by agriculture. How many times have produce companies tried to market fruits that tasted better than they looked only to have them rejected by consumers (personally, I’d rather chew on cardboard than a ‘red delicious’ apple, but people keep buying them). People scream about overuse of fungicides and pesticides, but don’t try to sell them a head of lettuce with a few spots on it. Farmers didn’t insist that the American consumer get less marbled meat. The consumer insisted on lower fat content and that’s how you get it. Of course, I could go on and on, but the point is that people want to hold marches and sign petitions INSISTING that things be done a certain way, but when they go to the store, they keep buying the prettiest apple, the leanest steak and the trendiest bottled water. They write laws demanding free-range eggs and then buy the conventional ones because they’re half the price. Even the organic produce has to be camera ready or it will rot on the shelf. It’s just crazy! Chipolte talks about highly processed foods but they are just as guilty. Here is the ingredient list for their flour tortilla. How would Chiplotes feel if someone made a video about how they make tortillas? Bleaching the flour and then adding chemical after chemical? And their sodium content of food is overwhelming. The tortilla alone has 670 mg. Tomato salsa 470 mg. While I do not support the Scarecrow commercial and in no way am I trying to defend them, the ingredients listed as enriching the wheat flour are B-vitamins and minerals….not chemicals. I have a question for Ms Winch. Does Chiplote pay extra to you? Does it pay enough for current convention farmers to switch to pass their inspection and be profitable? No wonder they can’t get enough “natural” beef. 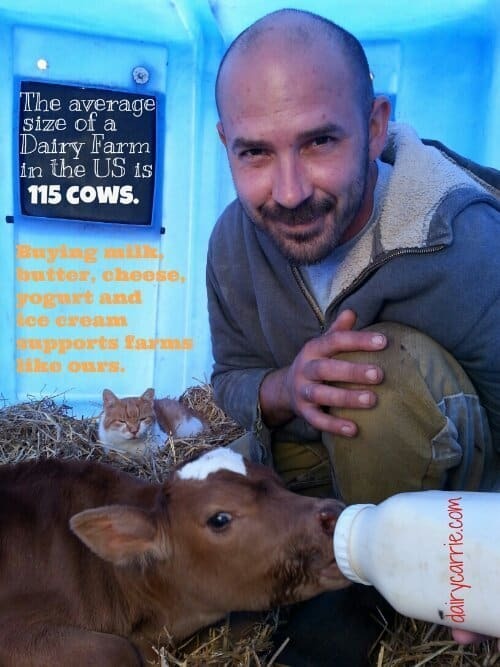 I am a former dairy farmer. How much is the premium in cents per cwt? Ron, I’m NOT a former dairy farmer! How about not using abbreviations those outside of the industry don’t understand. I can assume what it may mean but you know what they (whomever “they” are) say about assuming! The Scarecrow video will be followed up by four TV show–length Farmed and Dangerous short movies sometime next year. I absolutely refuse to darken the door of establishments that use the type of negative marketing displayed in the scarecrow video. Images displayed in this video are not even close to reality. This video places distorted views of reality in the minds of agriculturally naive people. Mrs. Winch’s ideas of positive marketing, using images of real farmers supplying the chain makes much more sense to me. My mother always said you can catch more flies with honey. While I congratulate Chipotle for doing their research and appreciate Christina’s insight, this just solidifies the fact that Chipotle does value and understand the reality of the agriculture industry but rejects it for marketing purposes. Based on their visits and audits of the Winch farm, they should clearly understand that the concept of a factory farm is as imaginative as their latest video. Unfortunately, they’ve also done their market research and have played on consumers’ misguided and uneducated feelings about food. Chipotle knows that the reality of the agriculture industry does not sell burritos or make $3 Billion dollar, annual profits. They made the choice to use feelings over facts and thats unfortunate to the hard-working and ethical farmers like Christina.